Advances in Geophysics, Volume 59, the latest in this critically acclaimed serialized review journal that has published for over 50 years, contains the latest information available in the field. Since 1952, each volume in this series has been eagerly awaited, frequently consulted, and praised by researchers and reviewers alike. 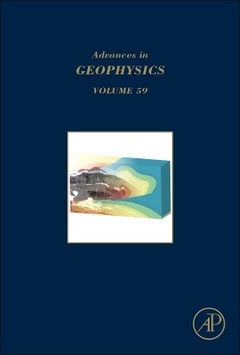 Now in its 59th volume, it is truly an essential publication for researchers in all fields of geophysics. Cedric Schmelzbach is a senior scientist at ETH Zurich, Switzerland. Dr. Schmelzbach, graduate of University of Zurich (B.Sc., M.Sc.) and Uppsala University, Sweden (Ph.D.), followed by postdoc positions at University of Potsdam, Germany, Freie Universität Berlin, Germany, and ETH Zurich, Switzerland, holds currently a senior scientist position at ETH Zurich. His research interests include seismic exploration at different scales, seismic spatial-gradient and rotational seismology, and multi-disciplinary investigations.